Please type your question about Windy Drive Duplex 128 A – Lower in the area below and click "Submit." We will get back with you as soon as possible. 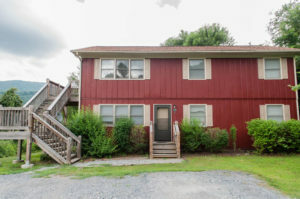 Walk one block to the App State campus from this captivating 2 BR Windy Drive Duplex Apt 128 A. It has a wonderful kitchen filled with wood cabinets and stainless steel appliances. The roomy living room opens onto a covered deck that overlooks the App State campus.